My husband and I wanted to invest in these for our small business. It was great idea and helped promote our brand. Appreciate all the help CEP. Eco-friendly and biodegradable drawstrings. I was able to showcase my brand at my most recent convention because of you guys. Thank you so much. Really pleased with how my bags came out. I received very patient service over the phone that helped guide me to what I was looking for. I will for sure be a repeating customer. Love these eco-friendly reusable drawstrings. They were the perfect fit for my small business. Couldn't be any more satisfied with my order. Affordable and convenient company to do business with. The service is phenomenal. I'll be sure to recommend your company to all friends and family members. You guys rock. I was able to customize these eco-friendly drawstrings with the colors I wanted and my business logo. Custom Earth Promos allows you to fully customize their items. Thank you CEP. Great product to help promote my business. Gave these eco-friendly drawstring bags out at my convention and it really did help generate business gains. Thanks a lot. I was very happy that I was able to customize these eco-friendly drawstring bags exactly how I wanted. My companies logo came out amazing and the color selection was great. Thank you. Very affordable price point that made me able to buy these eco-friendly printed drawstrings in bulk. Thanks Custom Earth Promos for being such a reliable company to do business with. This was my first time buying a product in bulk from Custom Earth Promos. Couldn't be more pleased with the final outcome on these eco-friendly drawstring bags. Thank you so much. Need a new way to attract a crowd to your business? 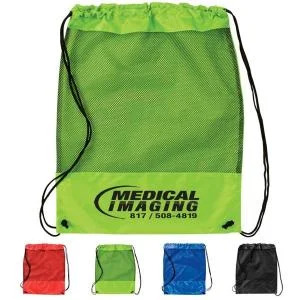 Print your company logo on our new Eco-Friendly Custom Printed Drawstring to maximize your market. You’ll be able to hand out these bags at your next trade event, making sure your name is carried throughout the rest of the day! Your brand will be able to expand into your potential green market, with these durable and eco-friendly bags! Use them for any daily activity! They can tote around extra clothes, small to medium sized items, sports items, school and work supplies, the list goes on! Make sure your customers get a product they can use over and over again without significant wear and tear. The 8" W x 2.25" H imprint area allows you to insert your custom made logo so that everything about this bag can exude your company pride! With the four solid and vibrant color options we have, your company’s logo will be a great contrast against the plain backgrounds. Our aggressive pricing is perfect for any business to work with so that you get the most bang for your buck! They’re also lightweight for easy storage and easy to clean. Need a reliable form of mass marketing communication? Make your next promotional step with us and you won’t regret it! At Custom Earth Promos, you get the best in recyclable products, customer service and personalization options! With a virtual spec platform and the assistance of our sales personnel, you will be able to create the best promo item your company has seen yet. Working with us is an easy process of get what you need and keep it moving. Take advantage of our flexibility and options to make a bag that truly reflects your brand message.